Click on the remarked companies to view images from this outstanding event. 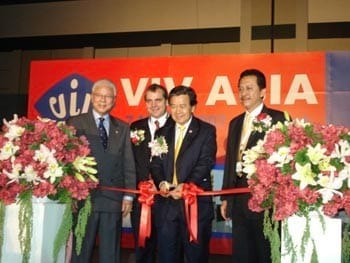 The grand opening of VIV Asia 2007 on 7 March 2007 at BITEC, Bangkok, Thailand has shone a bright light on the future prospects of the livestock industry in Asia. Over three days, VNU Exhibitions Europe and N.C.C. Exhibition Organizer expected more than 22,000 visiting professionals from around the region to walk the isles of the Bangkok International Trade and Exhibition Center. “From Feed to Meat” remained the main theme of the show linking the central marketplaces for meat protein in Asia-Pacific. More than 500 exhibitors together with 10 trend setting country pavilions were showing their latest and most innovative technology and solutions for the industry. New to this edition of VIV Asia was an extended exhibiter profile covering aquaculture and further processing of red meat. The objective was to catch up with the growing aquaculture industry in the Asia-Pacific, the world´s largest aquaculture production base. The extended profile also added to a knowledge base that helps the industry cope with export bans related to epidemic outbreaks. “VIV Asia 2007 added a few milestones to VIV Asia´s history.” Mr. Ruwan Berculo, Project Manager, VIV International, VNU Exhibition Europe. VIV Asia 2007 is setting a new record in exhibition space by adding an extra hall. By now, more than 400 of the world's leading suppliers from Feed to Meat have confirmed their participation to exhibit their latest innovations, and space applications are still coming in. The trend setting countries Belgium, China, Israel, Italy, Korea, The Netherlands, Spain and the United Kingdom will be displaying the best products on offer in their country pavilions. For the expected 22,000 trade visitors from the Asia-Pacific region, technology and innovation for their pig, poultry, egg and aquaculture business remain in the spotlights. "VIV Asia 2005 has been a crucial turning point for us," according to Mr. Ruwan Berculo, Project Manager VIV. "The show was held amidst the avian influenza outbreak but set an impressive record with 470 international exhibitors and visitors from 87 countries. Our investment monitor revealed that the show generated an investment spin-off of 1 billion euros. This demonstrates an interesting development trend in the Asian-Pacific livestock industry which will be extended by VIV Asia 2007." Aquaculture will be the special theme of VIV Asia 2007. Asia-Pacific is home to 90% of the world's aquaculture production. Slowing growth of capture production and high prices for fish have accelerated aquaculture production in the region, topped by catfish and shrimps. With the Aquaculture Walk and Forum, all suppliers active in aquaculture will become clearly visible at VIV Asia for the first time. This will create an excellent opportunity for exhibitors who want to capture the market and visitors who are searching for the latest technologies without wasting time. 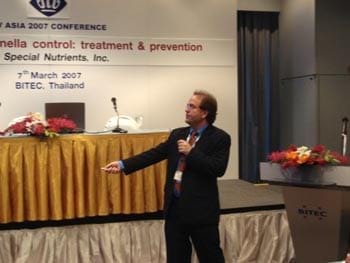 Finally, Novus offers a 3-hour conference on sustainable aquaculture at the VIV Asia Conference 2007. Following the successful introduction of the Feed to Meat concept at VIV Asia 2005, the upcoming edition will focus on extending meat processing of both red and white meat and traceability. These areas are in strong demand, not only for producers to overcome export difficulties, but also to add value to their farm products and match customers' stricter requirements and higher standards for food quality. For the first time, FPT joins VIV Asia. This company sells a vast range of premium products for red meat processing, from for example Multivac, Baader, Technopack, Schroder and Tipper Tie. The VIV Asia Conference 2007, sponsored by the Rabobank, will be an excellent educational forum for industry professionals to share their vision on the Asian animal husbandry industry in the years to come, especially regarding competitiveness. This year's topics will again cover the Feed to Meat supply chain. Nancy Morgan of the FAO is one of the keynote speakers. VIV Asia will host an afternoon conference of the American Soybean Association (ASA). The VIV Asia Conference 2007 is free of charge. (Visit www.viv.net for the full conference programme). 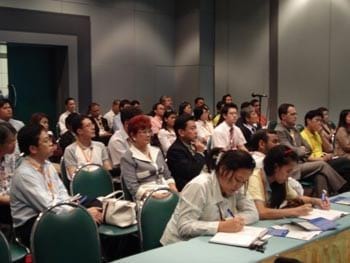 In the week of VIV Asia 2007, the World Poultry Science Association (WPSA) will organise the 8th Asian Pacific Poultry Conference (APPC 2007) - Science to Solutions - which is scheduled for March 5-6, 2007 in Bangkok in conjunction with VIV Asia 2007. Please check www.appc2007.org for more details.